Passion, manipulation and jealousy come to the Millennium Forum when Foyle Opera, in association with North West Opera, present Bizet’s Carmen on August 4 and 5. Carmen is one of the most beloved and staged operas of all time. Bizet’s powerful score, inspired by Spanish folk songs and rhythms, features many celebrated arias such as the March of the Toreadors, the Habanera and the Seguidilla, often used in TV, films and adverts for their instant appeal and dramatic impact. 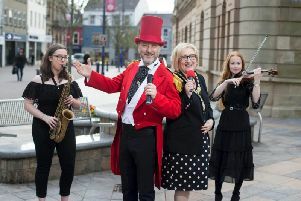 Foyle Opera aims to make a live opera experience accessible and affordable to the people of Derry/Londonderry, so if you have ever considered going to an opera, but never quite got there, this production is a great way to start. Performed in English, the show features an orchestra under the baton of acclaimed conductor John Page. Now based in Boston, John returns to the city of his birth, to lead an international cast of professional principals including Irish soprano Ann Jennings, in the title role. The project also offers a rare opportunity for singers and musicians to be able to perform in their locality, showcasing the fabulous talent that has emanated from Derry/Londonderry. The flair from the city is also in evidence behind the scenes, with award-winning director Deigh Reid embracing the challenge of bringing his own interpretation to the action between strong characters and dramatic storyline, all set to some of opera’s most stirring music. The tale is set against the sultry skies of Seville in the 1800s. When fiery gypsy Carmen is arrested for stabbing a fellow factory worker, she unscrupulously seduces army corporal Don José to secure her escape from prison. Hopelessly infatuated with her, and believing that she returns his love, Don José sacrifices everything he has, following Carmen into her band of smugglers. But Carmen will not give up her freedom so easily. When she abandons Don José for the charismatic bullfighter Escamillo, the forces of fate take over, culminating in one final battle between Don José’s desperate love and Carmen’s unbreakable spirit. For tickets, contact the Millennium Forum box office on 028 7126 4455 or book online at millenniumforum.co.uk.